Select CO2 provides a portable, powerful, and pleasurable vape experience. Cutting edge cartridges are filled with exquisite oil extracted from exemplary cannabis for an enthralling and effective escape. The sativa-dominant hybrid Double Dream puts a unique spin on the famed Blue Dream by crossing it with Dream Star. With a complex flavor profile that synchronizes sweet floral notes with berries and spice, Double Dream is a soothing and mentally invigorating strain that still allows clear-headed functionality. Its dreamy, euphoric buzz is anchored by a deep, physical relaxation. Battery not included. Recommended for use with Select batteries only. Each Select cartridge is cured for 48 hours and hand-inspected before making its way out to dispensaries. Select products pass through 7 levels of Quality Control checks before they are loaded up and sent to dispensaries. 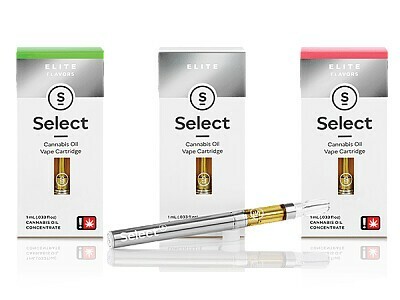 Select is committed to sourcing their oil from the finest flower, & using state-of-the-art hardware in every cartridge. Want to know more about this product? One of our experienced consultants is ready to assist you every day from 9am-9pm. Call us at 510-540-6013 ext. 3, or send an email to express@mybpg.com.